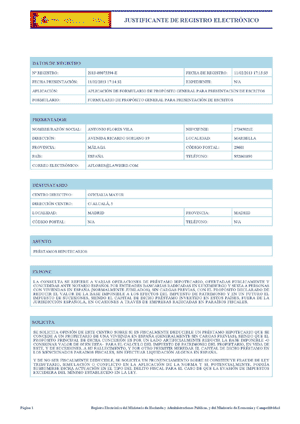 Having been made aware that NORDEA BANK LUXEMBOURG may be assisting inheritors on the delicate issue of filing IHT returns in respect of deceased subscribers of the tax-evading Nordea Mortgage + Unit Linked Policy package, it was deemed convenient to report this to the Spanish Tax Office. 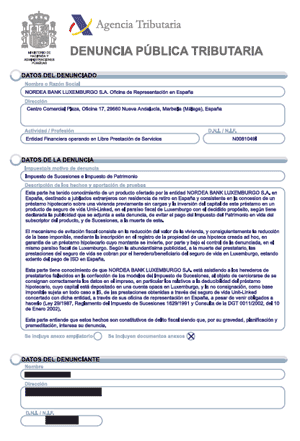 The “denuncia” informs the authorities that NORDEA Bank Luxembourg S.A. could be advising inheritors on how to fraudulently register the mortgage loan in the tax form, as a real debt, also fraudulently leaving out the value of the unit-linked policy altogether, even though the sums obtained by the inheritors are fully taxable in Spain whether the inheritor is a resident, or not, contrary to Nordea’s publicity. Tax Fraud is a crime prosecutable in Spain where the sums defrauded exceed €120,000. Nordea Bank Luxembourg must feature top of the list in this imaginary list of indecent foreign banks that once operated, and still do, in Spain. From a tiny office in Marbella, Centro Plaza, they have scammed untold numbers of otherwise happy British (and probably many fellow-nationals) property owners. This booklet will soon be studied by investigators in tax evasion criminality, scholars and Universities of all over Europe. Across the Atlantic, the US Attorney’s Office in Manhattan is being sent a full dossier of the incriminating paperwork for their consideration, as it appears that Nordea Bank Luxembourg also felt the need to cheat the US Internal Revenue Service. Rothschild and Landsbanki have packed up, knowing the extent of the damage. Judicial action will soon catch up with these banks. 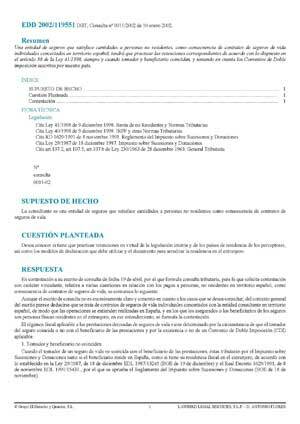 Lawyers for ERVA have formally requested the Tax Office to provide an opinion on whether the widely publicized and marketed “tax-mitigating mortgage” is, from a tax point of view, a legal option under Spanish laws. No sooner we get an answer than we will be publishing its content on this site.